A catch-up of a visit to the midlands back in April 2011. For some time Stephen and I had been wanting to visit Coventry Cathedral to see the amazing Nave windows, designed and made by a team of three led by Lawrence Lee and comprising himself and two former students, Geoffrey Clarke and Keith New. You can read Stephen’s take on the story here. The ten windows, each 70ft high, were a particular challenge to the artists and many believe they are one of the undersung treasures of the cathedral, in part because they do not face the congregation, but instead face the altar. And they are a nightmare to photograph. Some of the ten nave windows at Coventry Cathedral, facing the altar, and somewhat drowned out by the very bright west window – John Hutton’s Screen of Saints and Angels. Here you can see the two red windows which were Lawrence Lee’s designs. We had arrived in Coventry the night before visiting the cathedral and could not have chosen a better place to stay for convenience as the hotel was almost touching the cathedral. The built-up nature of the area means that Basil Spence’s creation is not afforded the space to stand proud, so much of its architectural style can only be admired from inside the building. The very bright west window was designed to allow a continuity between the new structure and the old ruined cathedral. It is a concept I can admire, but I feel that in practice the strong light from this window does a disservice to the stained glass within. 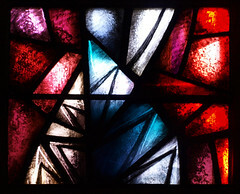 For a better consideration of the cathedral and the glass than I could ever hope to offer, you may wish to visit the Coventry Cathedral Flickr group which has been set up by stained glass artist and friend of the LSL project, Aidan McRae Thomson. His commentary on this and other ecclesiastical buildings and their stained glass shows an extensive knowledge of the subject and he offers insightful speculation too. You can also view his own work here. The ten windows were divided between the three artists with LSL taking the two red windows and one of the gold. The second gold window was a collaborative design. It was not possible to do justice to any window in its entirety, and even with a steady tripod, photographing the tops of the windows yielded disappointing results. I had to content myself with capturing details of the lower sections of the windows. I console myself with the fact that there seem to be no better images available online, nor at the cathedral itself. The challenge remains and I hope to return with better equipment and a solid plan. I will return often to the subject of the Coventry windows on this blog, so will leave it at that for now – there’s plenty to read on the links already provided, although if you have any questions or comments, please do add them below. The following day we met up with Aidan for a trip around some of the churches around the Birmingham area with Lawrence Lee windows. Our first port of call was the beautiful 12th century church of St Alphege at Solihull. Here was a very striking window with a powerful depiction of the murder/martyrdom of St Thomas of Canterbury (Thomas Becket). The bottom of the design, shown below, depicts pilgrims through the ages. We then moved into central Birmingham to visit St Martin in the Bullring. This was a very busy church in the middle of the city, with many visitors milling around. To the right of the entrance was a ‘reception’ desk and behind that was the LSL window we had come to see. The staff very kindly allowed us behind their work area to view it more closely and were very interested to hear more about it from Stephen and Aidan. 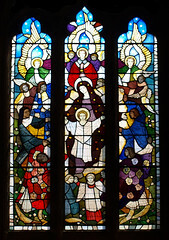 The window was quite large and very colourful, depicting the Madonna and Child at the centre of the design, with various figures and angels surrounding them. The window was made in 1980 and is known as the Thomas Baggs window, named after the former chorister who bequeathed it to the church. 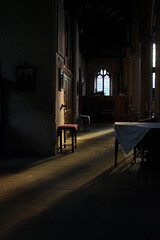 While we were there I also took advantage of the beautiful light flooding into the church and grabbed some photographs for my own collection. Unfortunately my camera battery died while we were there and the backup battery I had purchased, despite having charged the night before, was dead. Never buy cheap camera batteries. Luckily I still had my old trusty compact camera which served me very well for years before I was able to upgrade to a dSLR. Its major advantage is that it takes AA batteries. The downside is that the images are not of such high resolution. However, it was better than nothing. We moved on and tried to gain access to St Mary’s at Moseley, having failed to make contact beforehand. We weren’t lucky – the church was closed. Our final destination that day was St Saviour’s at Saltley. We weren’t hopeful about this visit either because the church is normally kept locked and as it was Easter, everyone was very busy. However, we arrived and were in luck as there was someone to let us in. Again the light was wonderful and even with my little stand-by camera I was able to get some good shots of the late afternoon sun. 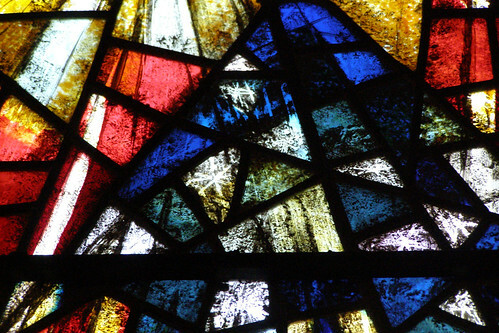 The Lawrence Lee window was a 1963 piece – an Annunciation window (detail below), full of colour and many abstract elements. Certainly a great example of his distinctive style. Before we left, the vicar arrived and we were able to have a chat with him before letting him get on with preparations for the evening service. For more about the church, see Aidan’s post here. We had hoped to take in a church on the way back south the following day and tried to see the window at Kingsclere. Unfortunately, even though the church was open, the chapel which held the LSL window was locked. A phonecall only gave us a rather unhelpful “come back on Saturday” response. I’m not sure when we will be able to slot Kingsclere into another outing as it is not near anywhere else we need to see, and Saturdays will inevitably be in the middle of a planned ‘tour’. Maybe a day trip some time. Some of the images link to larger versions of themselves, and some will take you to other views of the same window or to sources of more information. Always worth clicking through. There are also links within the text of this piece that might be of interest. This entry was posted in On the Window Trail and tagged Aidan McRae Thomson, Annunciation, Basil Spence, Birmingham, Birmingham Bullring, Bullring, church, church window, churches, Coventry, Coventry Cathedral, Coventry Nave windows, Geoffrey Clarke, glass, John Hutton, Keith New, Lawrence Lee, Lawrence Lee Project, Lawrence Stanley Lee, martyr, martyrdom, midlands, Saints and Angels, Saltley, Saltley Birmingham, Screen of Saints and Angels, Solihull, St Alphege, St Alphege Solihull, St Martin's in the Bullring, St Saviour's, St Saviour's Saltley, St Thomas of Canterbury, stained glass, stained glass art, stained glass window, stained glass windows, Thomas a Becket, Thomas Becket. Bookmark the permalink.